This black work trousers are strong and efficient. These black work trousers have several pockets: two large Italian pockets, a side tool pocket, a badge holder, a multifunction side pocket, two revolver pockets with velcro closure, an adjustable hammer door and two elastic knee pockets at the waist. inside. The pants have an adjustable elastic waistband for maximum comfort. The velcro supports of the trousers are reinforced as well as the structure of the crotch. The pants have reflex lines for optimum safety. The pants have anti-scratch buttons . The pants have several pockets . Machine washable at 40 ° C, no bleach, ironing at low temperature, dry cleaning without solvent, low temperature drying. These pants are available from size 38 to 58 and several colors gray, black, blue, sand and dark gray. 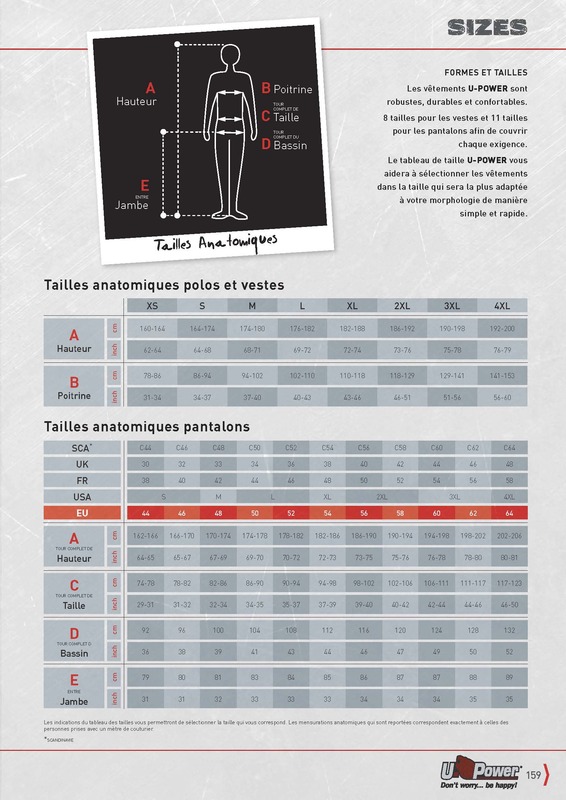 The U-POWER size chart will help you select the garments in the size that will best suit your body in a quick and easy way. Click on the image for a full screen display.